For some months now, the standard “G C E A” tuning has ceased to convince me entirely. How is it possible for an instrument that, throughout its brief history, has been used in a multitude of dimensions known as the voice registers (soprano, contralto/concert, tenor, baritone and bass) must always have the same tuning? 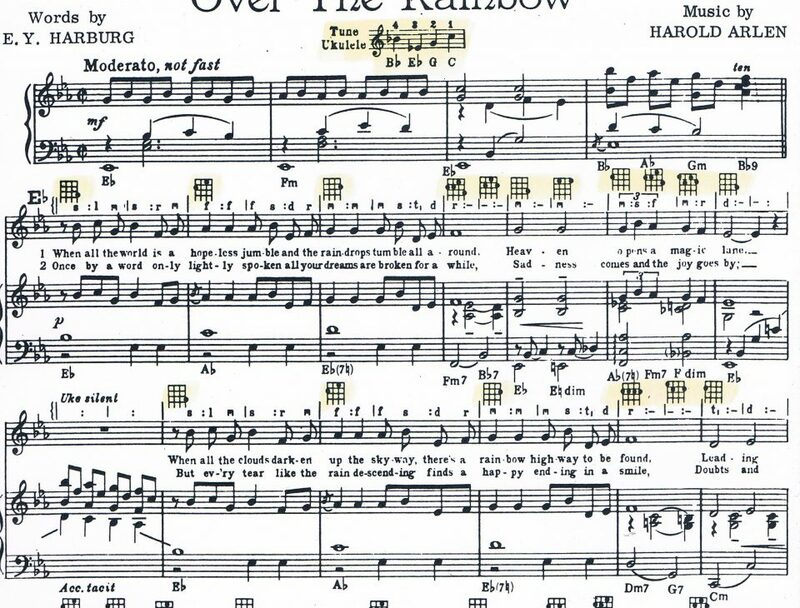 With the exception of the last two in the family due to being the most recent and perhaps less characteristic in deviating from the sharp sound of the original ukulele, most ukulelists , especially Italians, tune all the others (soprano, contralto, tenor) in “G C E A”. In this case, those who manifest a certain antipathy for this-or-that instrument or who express the uselessness of some would be right. Let me explain. There are those who consider concert to be uninteresting, much preferring the soprano and the tenor. There are those who would never betray the tenor, considering it even sharper than the soprano. Yet others do not even take the baritone into consideration due to being too “guitary” when they then idolise the bass without the suspicion arising that even this is too “bassy”! In short, I think we need to clarify all of the ideas on this subject and, as is often the case, history can teach us a lot. 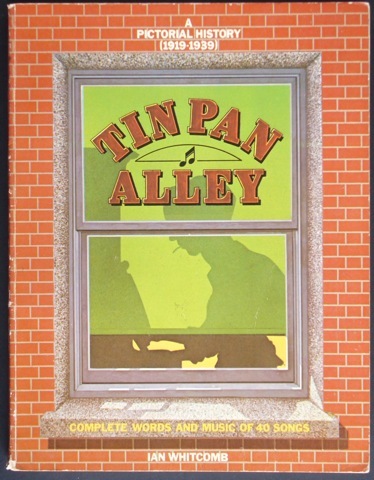 In the wake of my recent infatuation with the work of Ian Whitcomb, I came across a publication titled TIN PAN ALLEY: A Pictorial History (1919-1939). 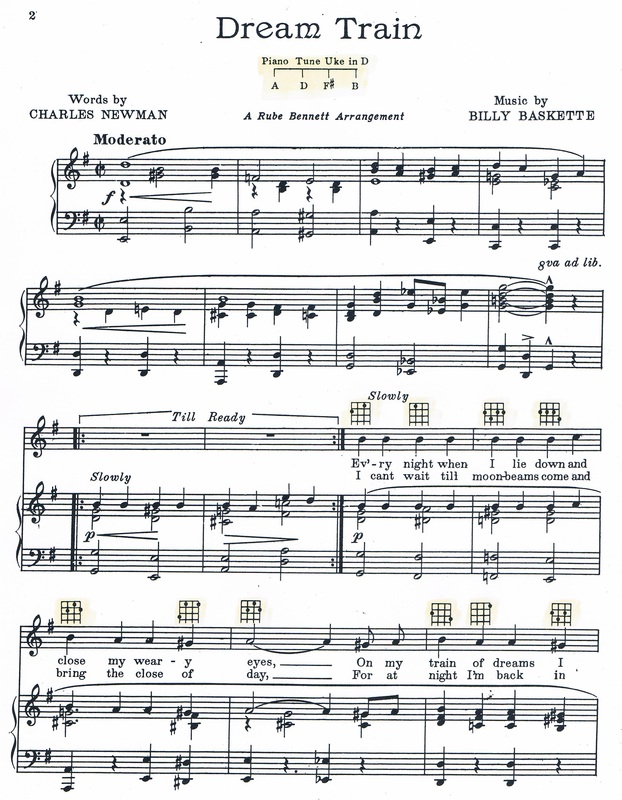 In this large volume, along with interesting information on the music from the Tin Pan Alley period, Whitcomb offers 40 reproductions of scores from the era, some of which have a diagram of the chords for ukulele. Leafing through these pages, it is clear that the addition of explicit instructions for ukulele had the clear intention of encouraging the sale of these sheets of music that formed part of the Tin Pan Alley business. Underlining this was the conviction that the more the music is shared, in its various forms, the more will be sold and thus more money will be earnt. It is well-known that May Singhi Breen was a determining figure in the popularisation of the ukulele throughout those decades and her insistence with publishers is evidenced by the insertion of the diagrams of the ukulele chords in the scores usually for voice and piano. Several interests converged on the same point. Riding the wave of interest in and enthusiasm for the ukulele was equivalent to even greater sales for the scores of successful songs. In this sense, also to be interpreted is the presence above the song’s staff of the alphabet musical notation of the Tonic sol-fa, a pedagogical technique for learning to read at first sight common in the Anglo-Saxon area and conceived by the English teacher John Curwen, which in Italy we call “Do mobile” thanks to the work of Goitre. In practice, I transport all the tonalities to C, which is the scale model that more easily acknowledges the melodic intervals to sing but also to play. 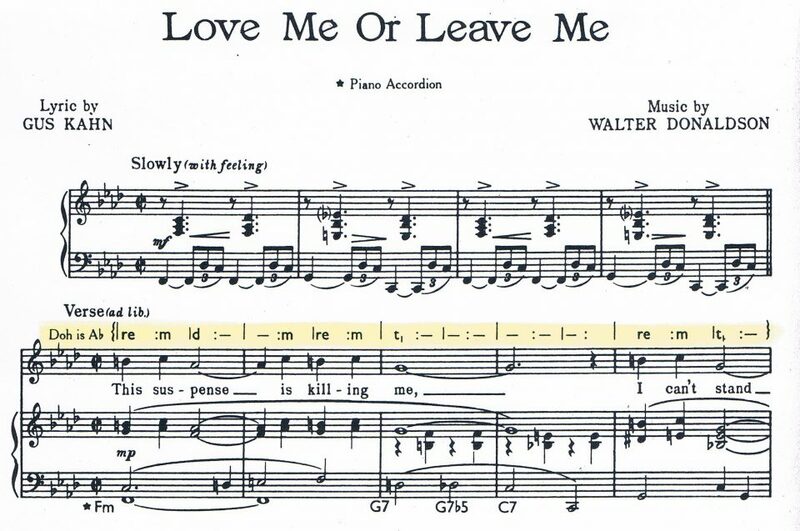 In the example taken from “Love Me or Leave Me”, the tonic C is equivalent to Ab, the letters of the alphabet (d r m f s l t with t that is equivalent to the note si, not to be confused with sol) correspond to the scale degree whilst the dashes and double dots indicate the duration of the sounds. It is a very intuitive notation. This also contributed to rendering each score more palatable and salable amongst those who could not read the staff but also amongst those who read at first sight with this teaching technique. It is evident that not all of these are practicable on the soprano and it is understood that Eb and Bb are jazzy tones that are compatible with the wind instruments common in jazz. It is not known if these tunings were done on a soprano, a concert or a tenor but it does not matter – what does matter is the versatility of our instrument that still has C and F major (in one case, also of F minor) in the chord positions, being the most resonant due to the simple fact that using the open chords produces a full resonance. Thus, the chords in the C tones are almost always used to harmonise songs in Bb or Eb, just like a mouth organist who replaces the instrument whilst maintaining the positions to be played unaltered or to a keyboard player using the transposer. You can distinguish songs in G that are often played with D tuning using the F tone chords. This is a simplification because only with few chord positions can you harmonise numerous tonalities by exploiting the different resonances of the tunings of the most high- or deep-pitched instruments. This practice was not at all sought after or difficult to achieve – to the contrary, it was simple and immediate, otherwise it would not have taken hold and would have quickly fallen into disuse. What information can we thus derive from all this? Firstly, the timbric richness of the ukulele family is far superior to what we are led to do today using only one type of tuning, apparently the easiest but actually very limiting. If to start playing the ukulele, tuning in C is greatly recommended, if not obligatory, to continue studying, writing songs, researching and adapting songs from other repertoires, “sacrificing” one or two ukuleles from one’s own collection to adopt different tunings is a choice that I highly recommend. A soprano could be raised a tone, to D, from the outset. It is the easiest transfer: play C and achieve D, play G7 and achieve A7, play F and achieve G, play C7 and achieve D7 and so on. You do not have to study new positions but merely carry a tone over those that are already known. The concatenations of chords are the same, the motions are the same, whilst the resonance is sharper as required in this repertoire but this also responds to the collective imagination for which the ukulele “pierces” the orchestra, making itself heard just like a piccolo or a soprano saxophone. If you have vintage instruments or a banjolele, it is most likely an obligatory tuning – finally, you will no longer have to question the type of tuning to use because those employed do not render but on the level of the sounds for which your soprano had been designed. Personally, having rid myself of so many doubts by finding the right tuning to vibrate the soundboard or the skin, the choice of type/brand of strings was next, as it should be. After having tried D, comes the curiosity to try Eb. Its usefulness is in any case for those who play jazz songs, even more so with instruments in Bb and Eb or with the piano as in Charmaine! whose arrangement is expressly for the banjulele (sic). Continuing with concert is the only one of the family to maintain C as per tradition, whilst we also have two possibilities for the tenor: a tone below, being Bb, or a tone and a half below, being A. If you are not fond of the jazz repertoire and do not play jazz with others, I would recommend trying A, which is a half tone below. In practice: play C for A, play G7 for E7, play F for D. And so on. 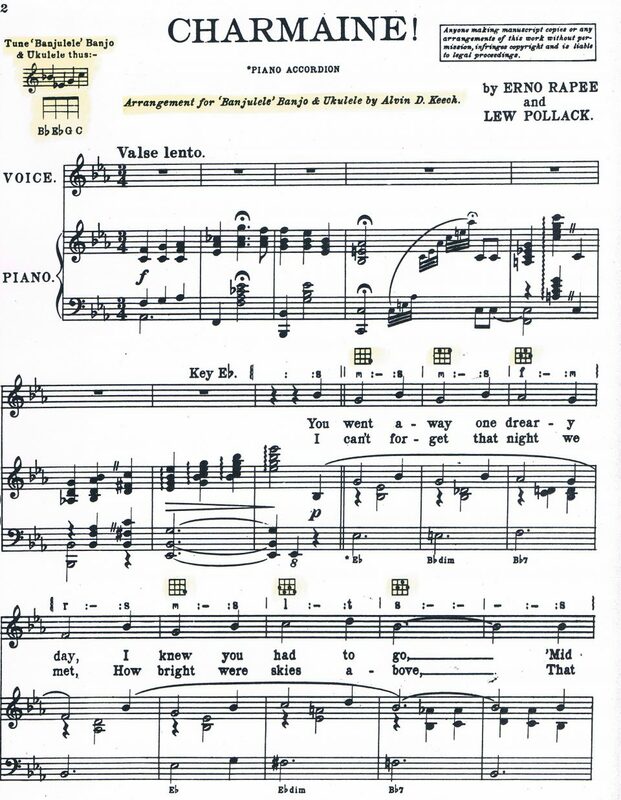 This all goes for the soprano but a discussion on the chords should be added. It is one thing to increase the tension of the chords, paying attention to the breaking point and to the bridge, and is yet another to lower and manage such to maintain a tension sufficient to create the correct vibration. I very empirically made a change to concert, reversing the positions with a result that I do not mind at all. Others use chords for baritone (D G B E), lifting them one tone (E A C# F#). Maybe they are right. Any advice would be appreciated. Personally, I am starting to experiment with arranging songs with differently tuned ukulele groups. From the first examples, the sound spectrum broadens in a surprising way and it seems as if you are listening to a ukulele orchestra, with a wider and fuller sound. All this is a matter of habit, of taste, of curiosity… if it was achieved in the glorious past, it seems a pity to overlook it now. Sure, at the beginning it is disorienting but I find all this fascinating and full of potential. Everyone can draw on this wealth as they see fit. You decide!